Long ago my husband and I made the decision to have a weekly date night, and it’s one of the best things we’ve ever done. I still remember in our very poor student days, our dessert would be a box of pudding that we made and shared while we played cards! There are weeks now when he’s traveling that we have to settle for a phone date, and often times our dates are in our home (takeout + movie or games), but it’s time we set aside for the two of us. This past week we went on one of our favorite dates—taking a picnic to a park and playing yard games. Whether we’re alone or invite other couples, it’s always so fun, and a great way to get outdoors and enjoy the fresh air together. 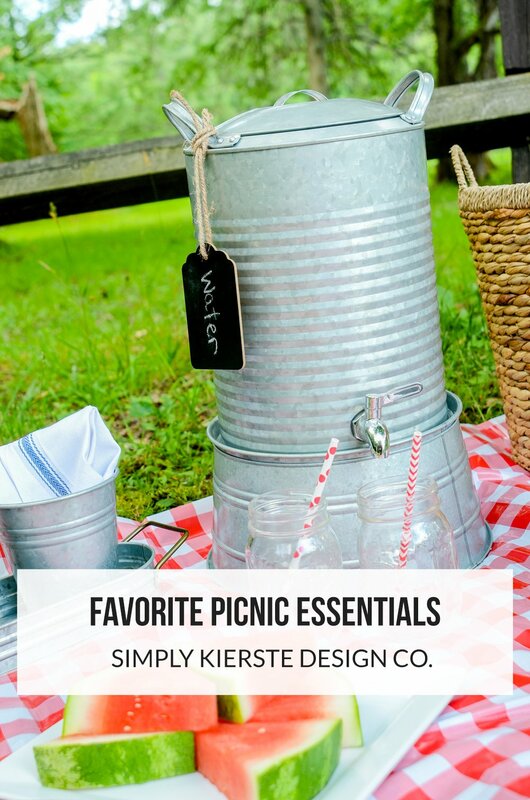 Today I’m sharing some of my Favorite Picnic Essentials…from serveware to food containers, they’re everything you need for a successful picnic! This post is sponsored by Better Homes & Gardens and The Clorox Company. All opinions are 100% mine. Red gingham just speaks “picnic” to me, and I love bringing a red gingham tablecloth to use either on the table, or even to lay out on the grass. This one is an inexpensive one that can be tossed if need be, or wiped off and re-used. When it comes to serveware, my go-to pieces are galvanized favorites. They’re so cute, and work for all of your outdoor entertaining, including picnics. The Better Homes & Gardens beverage cooler dispenser is a great size, and the stand makes it so much easier to dispense drinks. 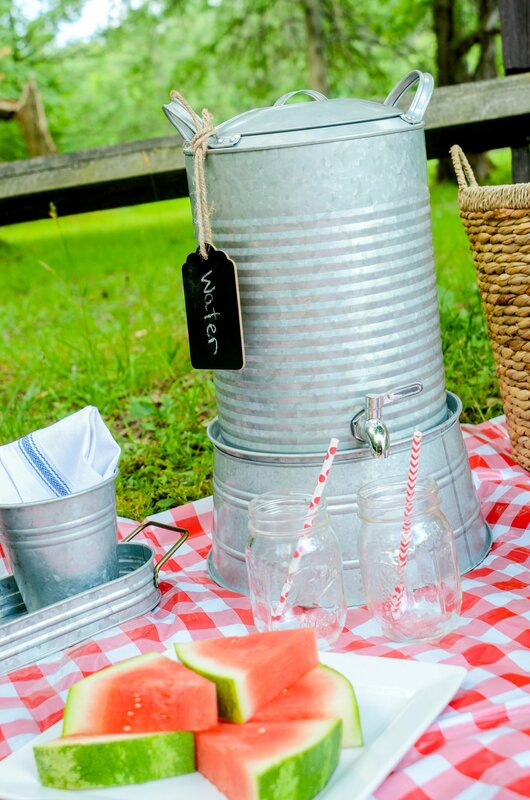 I love using mason jars as drinking glasses, and they fit the picnic theme so well too! The serve caddy is the perfect thing to hold silverware, napkins, straws, and other items. The pails can be removed and used on their own, or as a set—either way it’s adorable! I also love the lazy susan–it really does turn! With six good-sized compartments, it fits vegetables, fruits, chips, and pretty much any kind of snack you want to serve. The wood accents are so cute–I love both its functionality and looks. I don’t have a picnic basket, so I used this super cute round basket instead, and it turned out to be just right. The handles were perfect for carrying, and the basket fit so much! A serving tray is a great way to stack plates, napkins, containers of food, and anything else you need. I love the oval design of this one, and it can be used in your home as decor when it’s not in use for summer entertaining! Having a picnic means bringing food with you, and I’m a huge fan of Glad® Matchware. They make it so much easier to match the lid with the container, which I love. There are a variety of sizes, and they were perfect to bring our sandwiches, pasta salad, and watermelon slices. I made the yummiest dip for our veggies…just use a packet of Hidden Valley Ranch® dressing mix, 16 oz. of sour cream, and 1/2 c. of salsa (I like fresh salsa best), and mix well. SO good, plus super quick and easy. It’s perfect with tortilla chips too! I covered the bowl of dip with Glad® Press’n Seal, and it sealed it up like a charm for the trip from home to the park. Our date night was wonderful! Such a yummy picnic we had. Sub sandwiches, pasta salad, veggies & dip, watermelon slices, and of course, dessert, were all part of the menu. We went to a state park near our home, where there are plenty of trails for exploring, big trees for shade, and grassy fields for yard games like Bocce Ball! I’m already looking forward to the next picnic! What’s your favorite thing to do for date night? I’d love to hear!